12….11…10…9….IGNITION SEQUENCE START….6….5….4….3….2….1….0….ALL ENGINES RUNNING….LIFTOFF….WE HAVE A LIFTOFF! The Fed finally raised rates after nearly a decade. On December 16, the Fed decided to raise rates – for the first time since June 2006 – by 0.25%, or 25 basis points. It was widely expected by the markets and I only expected 10bps hike. Well, I was wrong on that. The Federal Open Market Committee (FOMC) unanimously voted to set the new target range for the federal funds rate at 0.25% to 0.50%, up from 0% to 0.25%. In the statement, the policy makers judged the economy “has been expanding at a moderate pace.” Labor market had shown “further improvement.” Inflation, on the other hand, has continued to “run below Committee’s 2 percent longer-run objective” mainly due to low energy prices. Remember when the Fed left rates unchanged in September? It was mainly due to low inflation. What’s the difference this time? So…umm…why did they raise rates this time? 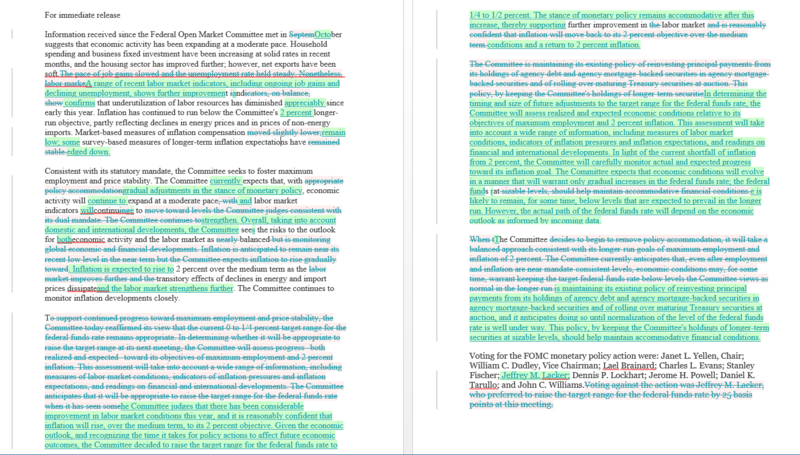 Fed Statement Comparison – Oct. to Dec. 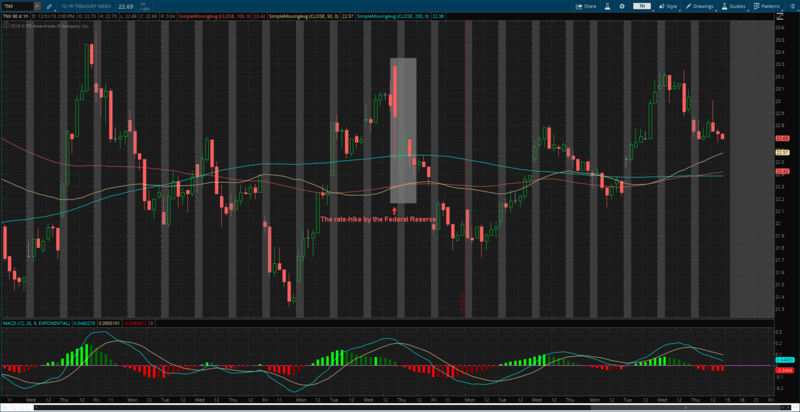 It seems to me that the Fed did not decide to raise rates. The markets forced them. Fed Funds Futures predicted about 80% chance of a rate-hike this month. 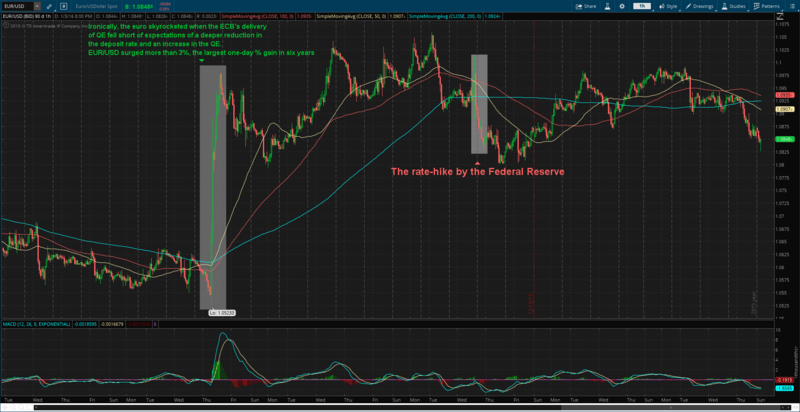 If the Fed did not raise rates, they would have lost their credibility. On December 3, European Central Bank (ECB) stepped up its stimulus efforts. The central bank decided to lower deposit rates by 0.10% to -0.30%. The purpose of lower deposit rates is to charge banks more to store excess reserves, which stimulates lending. In other words, free money for the people so they can spend more and save less. ECB also decided to extend Quantitative Easing (QE) program. They will continue to buy 60 billion euros ($65 billion) worth of government bonds and other assets, but until March 2017, six months longer than previously planned, taking the total size to 1.5 trillion euros ($1.6 trillion), from the previous $1.2 trillion euros package size. During the press conference, ECB President Mario Draghi said the asset eligibility would be broadened to include regional and local debt and signaled QE program could be extended further if necessary. ECB might be running out of ammunition. ECB extending its purchases to regional and local debt raises doubts about its program. Not only ECB is going the opposite direction of the Fed. Three weeks ago, Bank of Japan (BoJ) announced a fresh round of new stimulus. The move was hardly significant, but it is still a new round of stimulus. The central bank decided to buy more exchange-traded fund (ETF), extend the maturity of bonds it owns to around 7-12 years from previously planned 7-10 years, and increase purchases of risky assets. 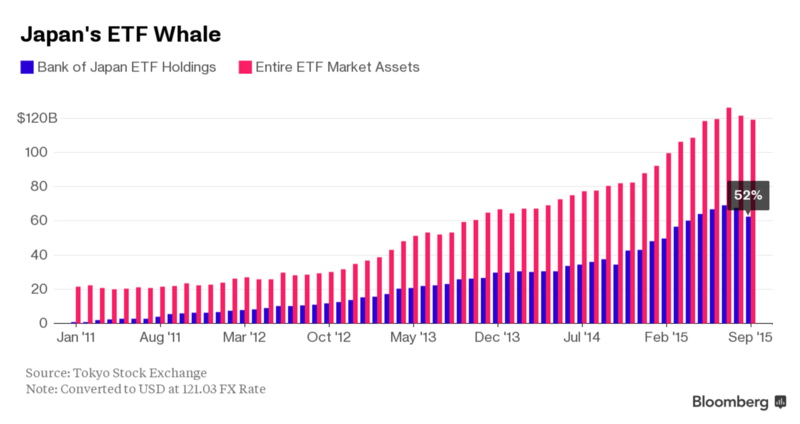 The extensions of its QE are beginning to become routine or the “new normal”. The move by BoJ exposes the weakness of its past actions. It suggests the bank is also out of ammunition. Already owning 52% or more of the Japan’s ETF market and having a GDP-to-Debt ratio around 245%, it is only a matter of time before Japan’s market crashes. Cracks are already beginning to be shown. I expect the market crash anytime before the end of 2019. So, what are the side-effects of these growing divergence? For example, the impact of a US dollar appreciation resulting from a tightening in US monetary policy and the impact of a depreciation in other currencies resulting from easing in its monetary policies. Together, these price changes will shift global demand – away from goods and services produced here in the U.S. and toward those produced abroad. In others words, US goods and services become more expensive abroad, leading to substitution by goods and services in other countries. Thus, it will hurt the sales and profits of U.S. multinationals. To sum up everything that is said in this paragraph, higher U.S. rates relative to rates around the global harms U.S. competitiveness. Emerging markets were trouble last year. It is about to get worse. International Monetary Fund (IMF) decided to include China’s currency, renminbi (RMB) or Yuan, to its Special Drawing Rights (SDR) basket, a basket of reserve currencies. Effective October 1, 2016, the Chinese currency is determined to be “freely usable” and will be included as a fifth currency, along with the U.S. dollar, euro, Japanese yen, and pound sterling, in the SDR basket. “Freely useable” – not so well defined, is it? Chinese government or should I say People’s Bank Of China (PBOC), cannot keep its hands off the currency (yuan). It does not want to let market forces take control. They think they can do whatever they want. As time goes on, it is highly unlikely. As market forces take more and more control of its exchange-rate, it will be pushed down, due to weak economic fundamentals and weak outlook. China, no need to put a wall to keep market forces out. Let the market forces determine the value of your currency. It is only a matter of time before they break down the wall. In August, China changed the way they value their currency. PBOC, China’s central bank, said it will decide the yuan midpoint rate based on the previous day’s close. In daily trading, the yuan is allowed to move 2% above or below the midpoint rate, which is called the daily fixing. In the past, the central bank used to ignore the daily moves and do whatever they want. Their decision to make the midpoint more market-oriented is a step forward, but they still have a long way to go. China saw a significant outflows last year. According to Institute of International Finance (IFF), an authoritative tracker of emerging market capital flows, China will post record capital outflows in 2015 of more than $500 billion. The world’s second largest economy is likely to see $150 billion in capital outflow in the fourth quarter of 2015, following the third quarter’s record $225 billion. Ever since the devaluation in August, PBOC has intervened to prop yuan up. The cost of such intervention is getting expensive. The central bank must spend real money during the trading day to guide the yuan to the level the communists want. Where do they get the cash they need? FX reserves. 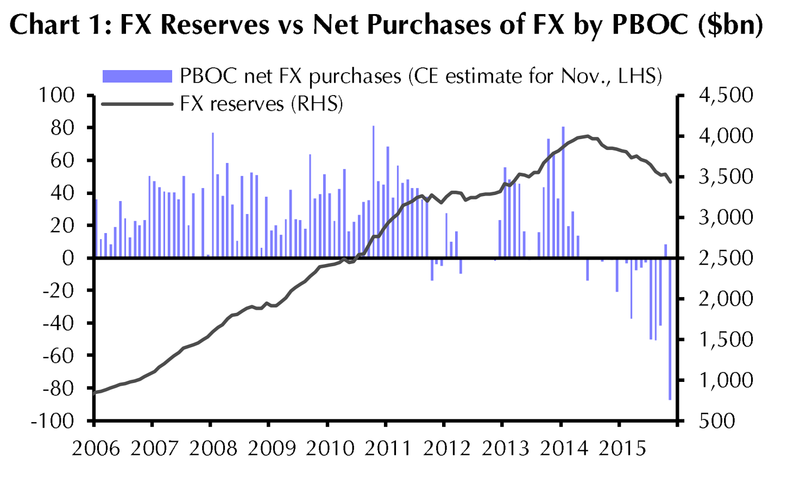 China’s foreign-exchange reserves, the world’s largest, declined from a peak of nearly $4 trillion in June 2014 to just below $3.5 trillion now, mainly due to PBOC’s selling of dollars to support yuan. In November, China’s FX (forex) reserves fell $87.2 billion to $3.44 trillion, the lowest since February 2013 and largest since a record monthly drop of $93.9 billion in August. It indicates a pick-up in capital outflows. This justifies increased expectations for yuan depreciation. Since the Fed raised rates last month, I would not be surprised if the capital flight flies higher, leading to a weaker yuan. Depreciation of its currency translates into more problems for “outsiders,” including emerging markets (EM). EMs, particularly commodities-linked countries got hit hard last year as China slowed down and commodity prices slumped. EMs will continue to do so this year, 2016. The anticipation of tightening in the U.S. and straightening dollar put a lot of pressure on EM. 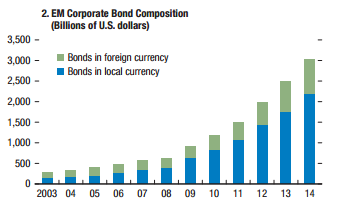 EM have seen a lot of significant capital outflows because they carry a lot of dollar denominated debt. According to the October report from IFF, net capital flows to EM was negative last year for the first time in 27 years (1988). Investors are estimated to pull $540 billion from developing markets in 2015. Foreign inflows will fall to $548 billion, about half of 2014 level and lower than levels recorded during the financial crisis in 2008. Foreign investor inflows probably fell to about 2% of GDP in emerging markets last year, down from a record of about 8% in 2007. Also contributing to EM outflows are portfolio flows, “the signs are that outflows are coming from institutional investors as well as retail,” said Charles Collyns, IIF chief economist. Investors in equities and bonds are estimated to have withdrawn $40 billion in the third quarter, the worst quarterly figure since the fourth quarter of 2008. Why are EMs so important? 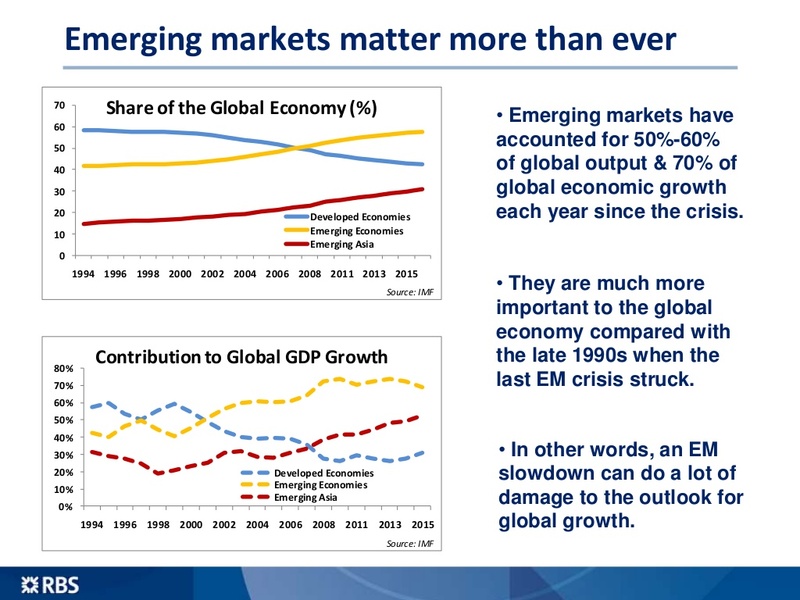 According to RBS Economics, EMs have accounted for 50%-60 of global output and 70% of global economic growth each year since the 2008 crisis. Some EM investors, if not all, will flee as U.S. rates rise, compounding the economic pain there. 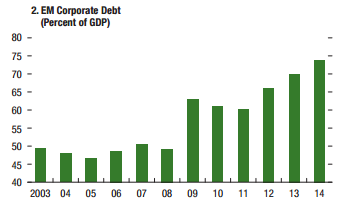 Corporate debt in EM economies increased significantly over the past decade. According to IMF’s Global Financial Stability report, the corporate debt of non-financial firms across major EM economies increased from about $4 trillion in 2004 to well over $18 trillion in 2014. 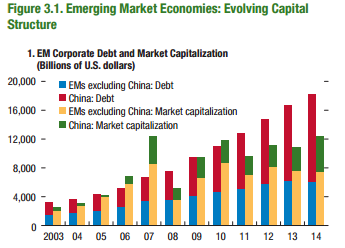 When you add China’s debt with EM, the total debt is higher than the market capitalization. 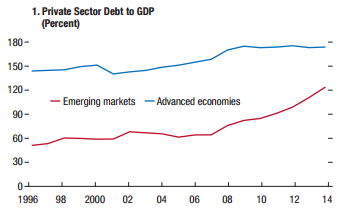 The average EM corporate debt-to-GDP ratio has also grown by 26% the same period. The speed in the build-up of debt is distressing. According to Standard & Poor’s, corporate defaults in EM last year have hit their highest level since 2009, and are up 40% year-over-year (Y/Y). I would not be surprised if EM corporate debt meltdown triggers sovereign defaults. As yuan weakens, Japan will be forced to devalue their currency by introducing me QE which leaves EMs with no choice. EMs will be forced to devalue their currency. Devaluations in EM currencies will make it much harder (it already is) for EM corporate borrowers to service their debt denominated in foreign currencies, due to decline in their income streams. Deterioration of income leads to a capital flight, pushing down the value of the currency even more, which leads to much more capital flight. According to its Global Financial Stability report, EM companies have an estimated $3 trillion in “overborrowing” loans in the last decade, reflecting a quadrupling of private sector debt between 2004 and 2014. I believe currency war will only hit “F5” this year and corporate defaults will increase, leading to the early stage of sovereigns’ defaults. I would not be surprised if some companies gets a loan denominated in euros just to pay off the debt denominated in U.S dollars. That’s likely to make things worse. Those are some of the risks I see that will force the Fed to lower back the rates. 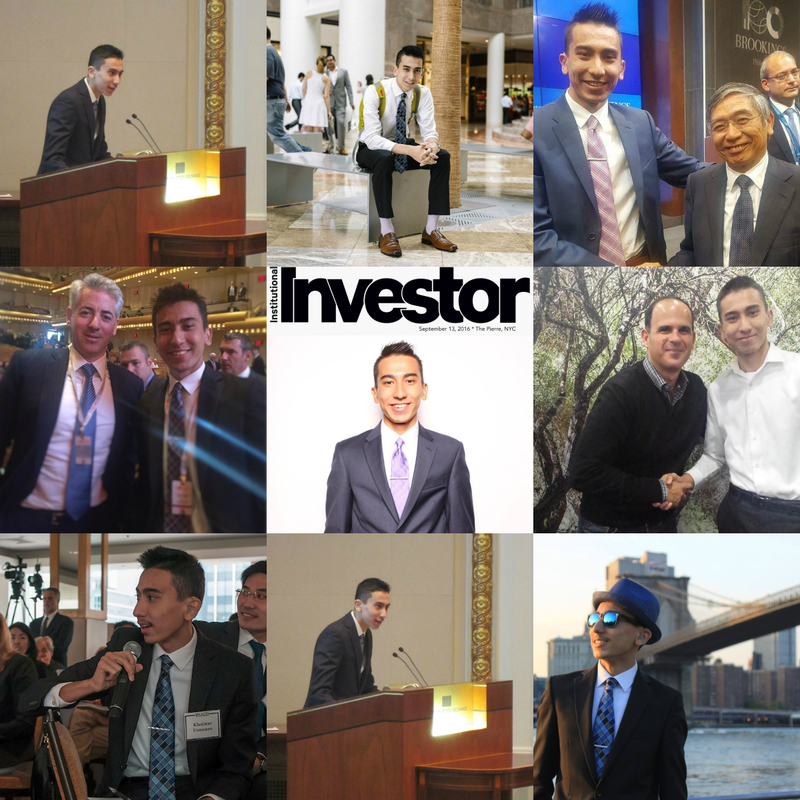 I will address more risks, including lack of liquidity, junk bonds, inventory, etc, in my next article. Thank you. Global markets crash. Currency wars. What’s next? Good buying opportunity? US markets: Markets plunged dramatically on Friday. The Dow Jones Industrial Average fell 530.94 points (3.12%), the worst one-day loss since November 2011 (on a % basis). The index is now down 10.2% (correction territory) below the May 19 closing and all-time high of 18,312, for the first time since 2011. For the week, the index is down 5.8%, the steepest decline since September 2011. S&P 500 fell 64.84 points (3.19%), the worst one-day loss since November 2011 (on a % basis) and falling below 2,000 level for the first time since February. For the week, the index is also down 5.8%, the steepest decline since September 2011. NASDAQ fell 171.45 (3.52%). For the week, the index is down 6.8%, the biggest weekly decline since August 2011. European Markets: European stocks fell into correction territory on Friday. The Stoxx European 600 1.3% to 368.59. The index is down 11% from April 15 closing and all-time high of 414.06. For the week, the index is down 4.6%, the worst weekly performance since December. Other indexes fell into correction territory also. Germany’s DAX Index is down 18% from its highs. So far, 13 out of 18 western-European markets have lost 10% or more from their highs. US oil prices fell just below $40 for the first time since February 2009, due to demand concerns and increasing supplies. US oil prices fell for their 8th consecutive week, the longest losing streak since 1986. 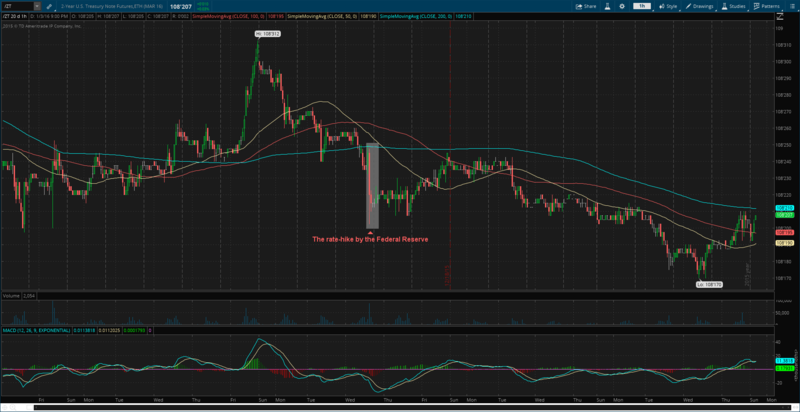 The CBOE Market Volatility Index (VIX) (also known as “Fear Index”) jumped 46.45% to $28.03 on Friday. For the week, the index rose 118.47% (from $12.83 to $28.03), largest % move ever in a week. There are concerns about slowing growth in emerging economies, particularly China. Economic data from China showed manufacturing PMI in China fell to a 77-month low of 47.1 in August, down from July’s final reading of 47.8. A reading below 50 represent a contraction. About two weeks ago, China’s trade data showed that July exports declined by 8.3% year-over-year (Y/Y) due to a strong yuan and lower demand from its trading partners. Exports to the Japan, European Union, and United States fell 13%, 12.3%, and 1.3%, respectively. Exports are China’s strongest growth machine. The weakness in the fundamentals started (still is) putting pressures on policymakers. Then, a surprise move came. On August 11 (days after the exports data), the People’s Bank of China (PBOC) made a surprising move to devalue its currency (so called “one-time” move), the renminbi (RMB) (or yuan), against the US dollar (greenback) by 1.9%, the biggest devaluation since 1994 and first devaluation since the yuan was de-pegged from the dollar in 2005. PBOC decided to lower daily reference rate – which sets the value of yuan against the greenback – to make yuan more market-oriented exchange rate. China’s move increased concerns over the health of its economy (second largest economy in the world) and shocked the global markets which continues today. China’s devaluation signaled that the economy there must be worse than what everybody believes. Continuous slowdown as it shifts from an export-led economy to a consumer-led economy has led Chinese government (or PBOC) to help stimulate economic activity. Over the past year, they cut interest rates four times and cut RRR (Reserve Requirement Ratio) several times. The goal is to combat slowing growth by strengthening liquidity and boosting lending (so far, unsuccessful). The recent devaluation will make imports expensive and help boost exports (reminder: exports fell 8.3% Y/Y in July). Another reason behind China’s recent move is its desire for the yuan to be included in the International Monetary Fund’s (IMF) Special Drawing Rights (SDR), a basket of reserve currencies, in which the US Dollar, Euro, Japanese Yen, and British Pound are part of. Earlier this week, IMF decided to extend its scheduled revision of SDR basket (revision takes place every five years) by nine months (to September 30, 2016), giving China more time to make yuan (or Renminbi ) “freely usable”, a key requirement join the SDR basket. Rise of Yuan against most of its trading partners’ currencies has made its trading partners exports attractive. US rate-hike would have made China’s export rivals even more attractive. Now that China devalued its currency in the wake of falling exports (reminder: exports fell 8.3% Y/Y in July), its trading partners would want to protect their exports share. Therefore, China has fired the first shot to start currency wars. Countries like Australia, Thailand, New Zealand, Malaysia and Canada are likely to suffer from China’s devaluation. These countries are largest exporter to China. Don’t also forget that these countries can affect other countries. Basically, it is “Domino Effect” economically. Earlier this week, Kazakhstan – whose top trading partners are China and Russia – switch to a free float (which means that the central bank stopped managing the exchange rate), causing its currency, the tenge (KZT), to fall 25%. The move comes due to three reasons; crude prices (Kazakhstan is central Asia’s biggest crude exporter) fell 55% in the past year, Russian has allowed its currency (ruble) to depreciate significantly as commodity prices plummeted, and due to the yuan devaluation. The motivation for the move is to preserve its export competitiveness. Vietnam has also allowed its currency, the dong, to weaken further due to the recent devaluation by its biggest trading partner, China. 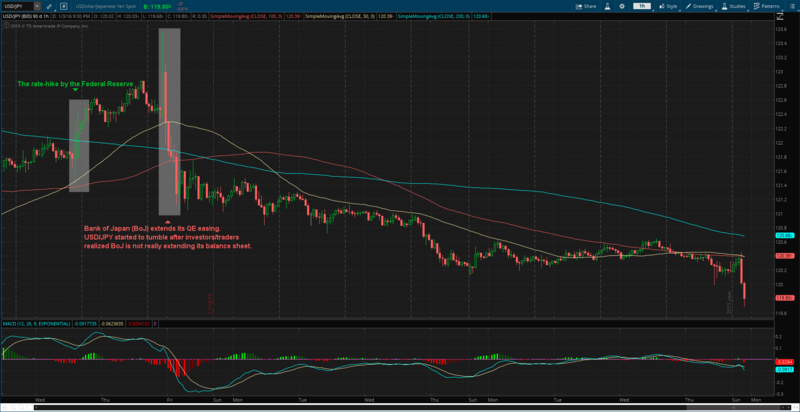 Who will be next to devalue their currency in this crisis; Asian Crisis Part 2.
Commodities denominated in US dollars will become more expensive to buyers in China, the world’s largest consumer of raw materials. When China’s economy slows, demand for raw materials, such as copper, Iron-ore, etc decreases and the lower demand puts downward pressure on commodity prices. China, second-largest oil consumer, is causing oil prices to drop non-stop, which will hurt oil exporters, such as Canada (possibly leading to another rate-cut). Falling commodity prices mean one other thing; deflationary pressures. Slow growth and lower commodity prices most likely will lead other central banks, especially large commodity exporters to maintain their easy monetary policies for longer. Countries with large current account deficits and/or corporations with large amount of debt denominated in US dollars could see their economic/financial conditions worsen, causing them to further increase/expand their easy monetary policy (rate-cuts, for example). Not only commodity exporters and emerging countries will suffer, but also US companies. US companies with significant exposure to China will suffer from China’s devaluation. Such companies are Wynn Resorts, Micron Technology, Yum Brands, and Apple, accounting for China sales exposure of 70%, 55%, 52% and 30%, respectively. When I noticed China economic getting worse earlier this year, I knew Apple depended on China a lot, so I said that Apple was overvalued as more competitors were emerging and China’s economy was about to get worse. Even though Apple’s earnings came out better than expected, I went ahead on twitter and responded to Carl Icahn’s comments on the Apple and the market. He expected (maybe still expects) Apple’s stock price to double, which I did not (and I still don’t). More competitors are starting to emerge and China’s economic conditions are getting worse (debt bubble coming). Mr. Icahn believed the market was extremely overheated and expected market bubble. I have to agree with him. I preferred (still prefer) to use the term “correction”. At this time, I believe current market sell-off is temporary and the dust will be settled in a month (good-buying opportunity). I expect “market bubble” after the Fed raises interest rates to the range of 0.70% and 0.80% (early 2017?). That’s when market sell-off will be much worse than the current situation. I’m calling Mr. Icahn to respond to my questions; how do you think China’s action will affect global economies (or markets)? Do you still think Apple could double in price? Now, let’s get back to how else China can affect global economies (deflationary pressures). I expect Europe’s economy and Japan’s economy to slow down. Europe’s economy will slow down due to export demand decreasing and the uncertainty created by Greece (Yes, they did get a bailout deal, but it’s not over). That’s why I believe European Central Bank (ECB) will either lower interest rates even further or they will increase current Quantitative Easing (QE) program, pushing Euro currency lower. Current falling prices in the European markets are a golden opportunity. Lower interest rates and/or increased QE program will send European equity prices higher>>>all-time highs will be made. Japan, China’s largest trading partner, will also suffer due to export demand decreasing. The devaluation of yuan (or, Renminbi) will make Japanese exports less competitive. Japan’s economy is still suffering despite Abenomics (similar to QE). Recent data showed GDP (Gross Domestic Product) falling at annual pace of 1.6% in 2nd quarter, due to slowing exports and lack of consumer spending. Abenomics has failed. Additional monetary easing coming? If the economy does not get any better in the next several months, I expect additional monetary easing by the Bank of Japan (BoJ). I don’t believe the Federal Reserve will stop its plan to hike the rates, but it will slow the pace of it. On Wednesday (August 19), Fed minutes of July meeting (leaked earlier) showed that Federal Open Market Committee (FOMC) members “…judged that the conditions for policy firming had not yet been achieved, but they noted that conditions were approaching that point.” They also said that “…the recent decreases in oil prices and the possibility of adverse spillovers from slower economic growth in China raised some concerns.” US dollar has been falling ever since the release of fed minutes, as expectations for September rate-hike decreased. Now more troubles emerged, I wonder what the Fed will say or do. There are many US economic reports that will come until the Fed’s September meeting. The reports will decide the fate of rate-hike for September. At this time, I expect the Fed to hike the rates in September by 10 basis points (or 0.10%). If the current China situation (or Asian Crisis Part 2) gets out of control, there will be no rate-hike for the rest of year even if there’s strong US economic reports. All comments welcomed. Thank you. Disclaimer: The posts are not a recommendation to buy or sell any stocks, currencies, etc mentioned. They are solely my personal opinions. Every investor/trader must do his/her own due diligence before making any investment/trading decision.